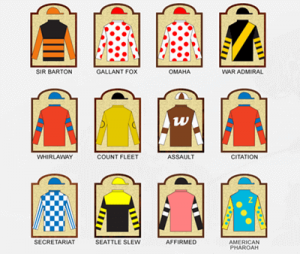 Why are Horse Racing Jockey Silks so Colorful and What do they Represent? 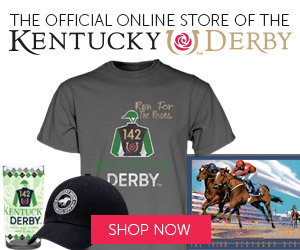 Horse Racing Jockey Silks – Why so colorful? If owners expect to race a horse in New York, at Aqueduct or in June in the Belmont Stakes, they must register their silks with The Jockey Club. 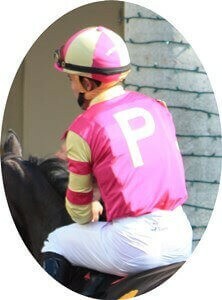 Horse Racing Jockey Silks colors represent who the horse owners are. 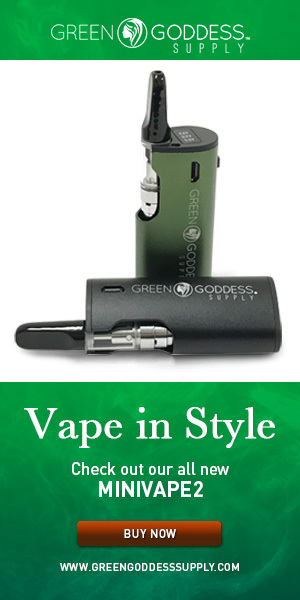 Every owner has their individual set of colors, which make it easy to identify in a race. 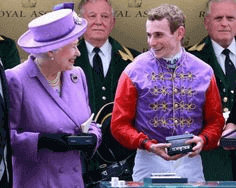 Queen Elizabeth II inherited jockey silk, which is a purple and scarlet jacket with gold braiding, with a black cap. 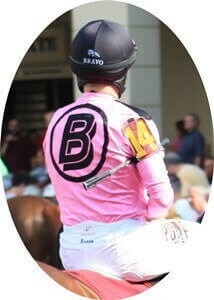 The Jockey Silks need to be registered and approved by The Jockey Club. 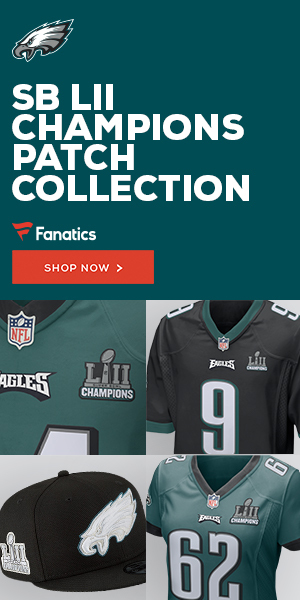 There are 38 patterns available for the body of the jacket, from solid to 4-inch checks, diagonal stripes to a single 10-inch circle, 2 ½-inch dots to crossed hashes. Sleeves offer 19 other possibilities, from hoops (horizontal stripes) to chevrons, blocks to stars, diagonal quarters to diamonds. Horse Racing Jockey silks are made of different kinds of fabric choices, nylon, satin, lycra and are custom made. The usual horse racing jockeys weight ranges from 108 lbs. to 118 lbs. and has a weight limit of 126 lbs which includes the jockey’s equipment. Jockeys must be able to control a horse that is moving at 40 mph and weighs about 1,000 lbs. Though there is no height limit for jockeys, they are fairly short due to the weight limits. 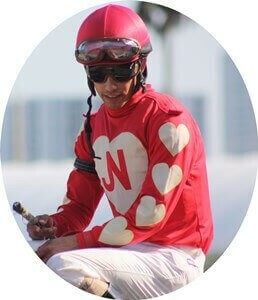 Jockeys height typically stands around 4 ft. 10 into 5 ft. 6 in. tall. 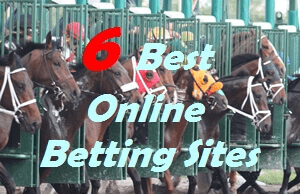 Jockeys are usually self-employed and get nominated by the horse trainers to ride their horses in a race for a fee which is paid regardless of the prize money. Jockeys will generally start out when they are young doing riding work in the morning for trainers and riding profession as apprentice jockeys. All jockeys must be licensed and are not permitted to bet on a race. The first Woman Jockey Anna Lee Aldred at the age of 18 galloped and got her jockey license in 1939. In 1970, Diane Crump was the first woman to ride the Kentucky Derby. Julie Krone was the first female jockey to win the Belmont Stakes in 1993 when she rode Colonial Affair. 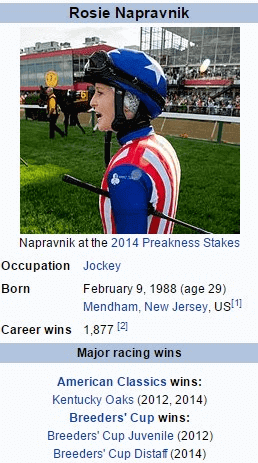 Rosie Napravnik became the first female jockey to ride in all three races in 2013 of the Triple Crown. There have been 12 horses that have won the Triple Crown as of 2015. They are all Legends in the Sport of Horse Racing.